Let's see, did I miss anything? Nope, I think that title about covers it, lol! Today's card is the one we are making in our Christmas Card Club today. 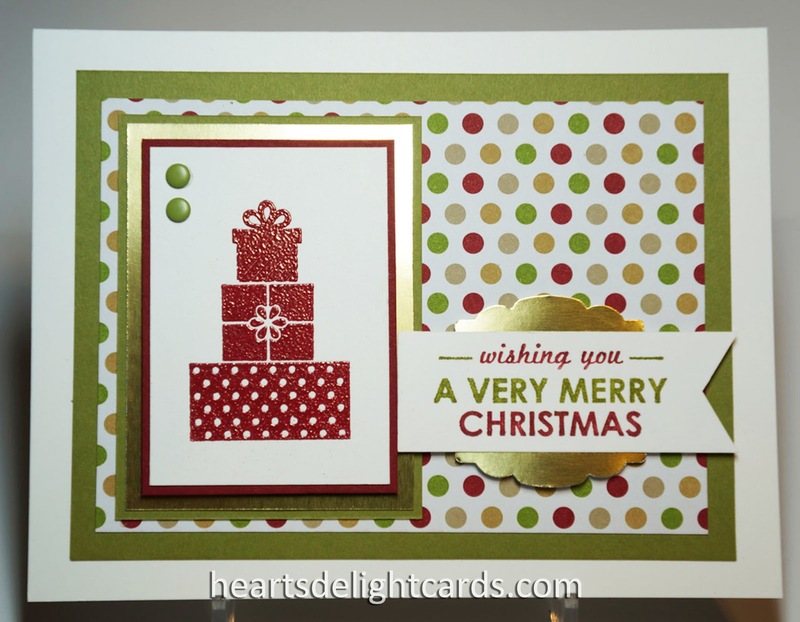 It features a new stamp set from the Holiday catalog (starts Aug. 1st), as well as some fabulous Christmas DSP from said catalog. Oooo, and see that shiny gold foil cardstock? That's in there, too! And, since today is Make it Mailable day, I opted not to put a ribbon and bow on it. The Candy Dots looked cuter anyway, and kept the polka-dot theme going. 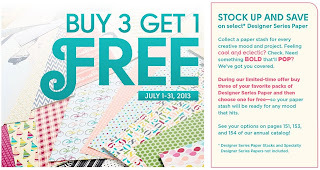 Did you know we're having a July special on Designer Series Paper? Buy three and get one free! Don't miss out on on this great deal! Click image below to shop. Note: The DSP stacks and Specialty DSP are not included. Keeping this post short and sweet today, since I'm up to my neck in Convention swaps. I'm starting to feel a bit anxious about getting them finished in time!!! Another gorgeous card, Cindy! I love the touches of gold and your use of the Artisan Label punch here in the background. Very clever! This is so elegant! I love the effect of the gold foil paper. Since the majority of my Christmas cards need to be mailed, I LOVE this inspiration!